Hello, Girl Has Thyme readers! Jenny graciously invited me to write a post about my crazy tomato bumper crop of 2013 quite awhile ago … I had great intentions to share some tips with you before Mother’s Day, but suddenly it’s June! How does this always happen to me?! So, my fellow procrastinators, this post is for you. If you haven’t yet planted your 2014 tomatoes, it’s not too late. It is late enough, however, that you should plant well established starts. It’s a good idea to try a few varieties — some may grow better than others based on the conditions in your garden, and you’ll be more likely to have success with at least one of your plants. A couple years ago, my friend, Christie, grew the most incredible sun gold cherry tomatoes. Sweet and juicy with a bright, tangerine orange color and perfectly textured skins — they gave a nice pop at the bite, but weren’t tough or thick. I had been growing tomatoes in Topsy Turvy bags for a few years prior (yes, the ads suckered me in) and had moderate success, but Christie’s plants convinced me to put plants in the ground and do whatever else she was doing! It worked (maybe too well). We had tomatoes for days. Hundreds upon hundreds, no exaggeration. 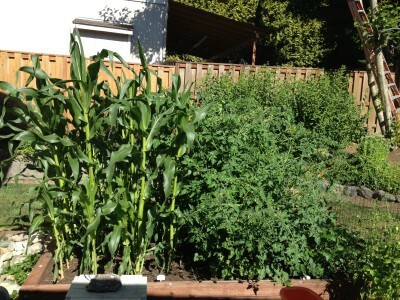 The photo above is of our garden on July 9. I don’t think our tomato plants ever had been this big by the end of the season in previous years. Tip #1: Both Christie and the folks at Molbak’s (my favorite nursery, located in Woodinville, Wash.) recommended Gardner & Bloome Harvest Supreme organic soil amendment. It’s formulated specifically for vegetable gardens to improve drainage, provide plant nutrients, improve physical soil structure, and help balance pH when mixed with existing garden soil. All of our plants, not just our tomatoes, produced a significantly higher amount of fruit than in years past. Our tomato plants grew so tall that they lifted the cage supports out of the ground, and then they got so heavy with fruit that they toppled over. They also were thick and dense, which made it difficult to get to the middle of the garden very well to maintain them. Lesson learned. This year we planted only three starts instead of six. We also have a handful of volunteers from last year’s seeds that are almost as big as our starts. We’re excited to see what these produce! 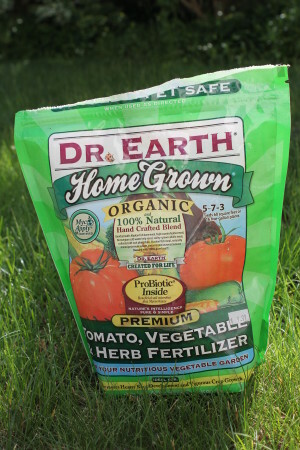 Tip #2: We switched from our run of the mill fruit and veggie fertilizer (I can’t remember the brand) to Dr. Earth Home Grown organic fertilizer. The nursery employee recommended we only use half the recommended amount on the package, which seemed to be ample. We’re still using the same bag this year and have a lot left. I don’t see an expiration date on the package, so I hope it will still be good for years to come, since there still is a lot left. This fertilizer, along with the soil amendment, were the two big changes that I believe helped make the leap from mediocre to mind blowing tomatoes. Tip #3: Remember that your plants will need supports. Canes/poles and wire netting work well for us. This all can be found at your local nursery. Tip #4: Water little and often, and water the soil, not the plant. You’ll help avoid split fruit and encourage steady growth. Tip #5: If your plants are still booming with green tomatoes when fall begins to hit, pick your green tomatoes and throw them in a bag with a ripening banana (yellow in the middle and a little green on the end). The banana with give off ethylene and help ripen the tomatoes so you can continue enjoying them. Start seeds inside to get a head start on spring!!! Do you have a good garden secret? Email me and I will feature it here!